This meal actually took us less than 15 minutes because we didn’t even have to chop the chicken but in case you do, 15 minutes from the start of cook time to finish! ⏩Heat a season cast iron skillet over high heat. ⏩Add 1 Tablespoon of the oil and heat until shimmering. ⏩Add the chicken and season with a pinch of salt and pepper. ⏩Turn the heat down to medium and cook, stirring occasionally until the chicken is cooked through, about 4 minutes. ⏩Remove the chicken to a plate. ⏩Add the remaining oil to the pan and add the broccolini, carrots, and peppers. ⏩Cook, stirring occasionally for 2 minutes. ⏩Add the mushrooms and bok choy and cook an additional 3 minutes. ⏩Meanwhile, run the precooked noodles through hot water to separate the noodles. ⏩Whisk together the soy sauce, stock, honey, brown sugar, ginger, garlic, and cornstarch. 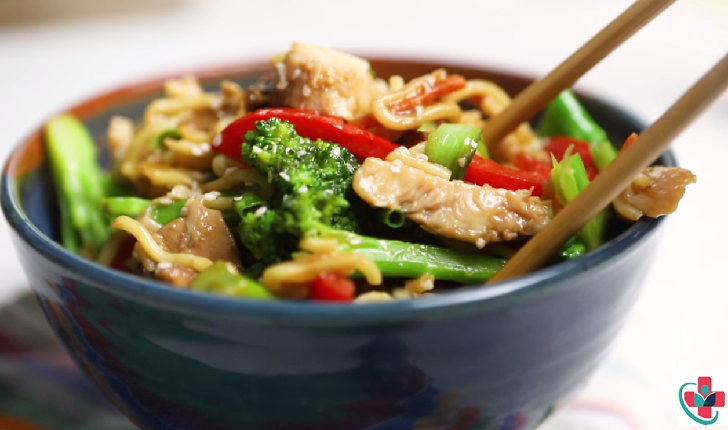 ⏩As soon as the veggies are tender, add the chicken and noodles to the pan and pour in the sauce, toss for a minute or two and serve hot with a garnish of green onions and sesame seeds.